While I’ve been pleasantly surprised at how easy Thanksgiving and Christmas were this year, I suspected that New Year’s would be hard. 2013 was a truly awful year. Doug was hospitalized beginning in November of 2012 on an off, including several stints in ICU, culminating with his death in June. While still reeling from that, the Beautiful Babette died in October and before I could catch my breath from that, the shelter dog I adopted died within a month. I learned a lot this year, but mostly I learned that anger is both destructive and constructive, love never dies, memories get sweeter, and people are basically good. I learned how loved I am and how blessed I’ve been. Still. It’s been an awful year and I’ve eagerly looked forward to 2014. I knew I had to get past this night though. Doug and I didn’t always have Christmas together. Only after he moved here did we have Thanksgiving together. But we usually managed New Year’s. 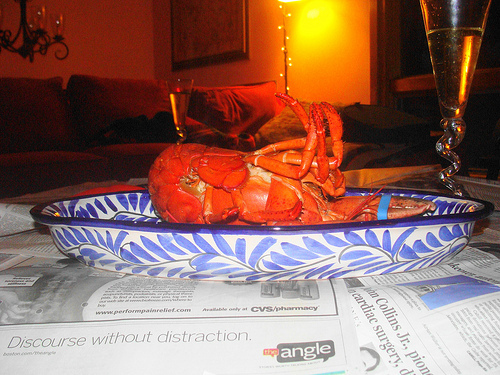 We always had live Maine lobster and copious amounts of champagne. Sometimes we’d get silly and dance. Sometimes we’d gaze lovingly into one another’s eyes. One time we watched a Twilight Zone marathon and I laughed at how none of my womanly ways could distract him. This holiday seems wrong without him. I have the champagne, but couldn’t bring myself to order lobster. I’m not listening to music or watching television though I am poking my nose into Facebook. I don’t want to wallow, but I do want to acknowledge these feelings of loss. This is the holiday he most should have been here for and is not. I’m a little lost with what to do with myself. I miss him a lot tonight. 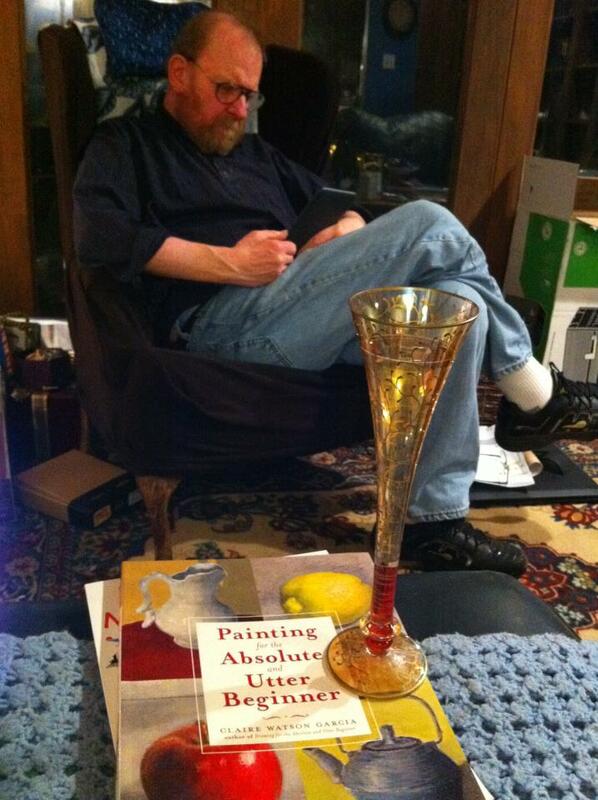 I’m behind on my blog-reading, Connie, and just catching up with you. I cannot imagine how difficult this day was, but I do know that what I have learned about you, and admire so much, is your strength. You face and name the demons. Sending my wishes for this year to be one of peace, healing and beauty for you.